Do you want to lighten your skin? The aim of Porcelana Day Skin Lightening Cream is to fade away dull, uneven skin tones and allow radiant, flawless skin to shine through. This product supposedly fades discolorations, blemishes, and dark spots that are caused by sun exposure, acne, pregnancy or oral contraceptives. 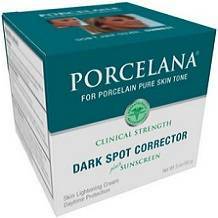 Our review of Porcelana Day Skin Lightening Cream is quite comprehensive. Take a look below. Hydroquinone U.S.P. 2%’s purpose is a skin lightener. Octyl Methoxycinnamate 2.5%’s purpose is sunscreen. This product is used for the gradual fading of dark spots in the skin, such as age spots. This product contains a sunscreen to assist in preventing darkening from happening again. We do not know if this cream is suitable for vegans. Adults that want to fade age spots or dark spots should apply a little amount as a thin layer on the affected area twice each day. Or this product should be used as directed by a doctor. If you don’t see improvement after 3 months of treatment, discontinue using this product. The lightening effect of this product might not be noticeable when it used on very dark skin. Sun exposure must be limited by making use of a sunscreen agent, a sun blocking agent, or protective clothing to cover bleached skin after treatment is completed to prevent darkening from happening again. This product is for external use only. Contact with eyes should be avoided. When making use of this product, some users might experience a minor skin irritation. If this happens, stop using this product straight away and ask your doctor for advice. This product must be kept out of reach of children. Note: Children that are under 12 years old should not use this product unless directed by a doctor. The instructions for using this product are quite detailed and easy to understand. People can buy this cream on the manufacturer’s website for just $7.99. This is quite a cheap price for this product. There is no free trial option offered for trying out this cream. From our extensive research, we have found out that the manufacturer does not offer a guarantee. The manufacturer only ships to the U.S. at the moment. As there is no guarantee offered, people don’t know if they can return this product to the manufacturer, or what condition they can return it in. We really liked that this cream contains antioxidants and sunscreen to assist in protecting skin from daytime environmental damage. Another plus is the cream’s amazingly low price – what a bargain! We also were excited that this cream is sufficiently light to wear under makeup or by itself. The positive customer reviews of the manufacturer’s products further demonstrate what great products these are. We weren’t so happy that there were no guarantees offered by the manufacturer. We also feel that customers should be able to have a free trial to see if they actually like the manufacturer’s products and if these products work for them.